A Catered Affair tells the story of a Bronx mother’s efforts to give her only daughter the elaborate wedding she never had – and the bride never asked for! Based on the film starring Bette Davis, Debbie Reynolds, and Ernest Borgnine, A Catered Affair is a funny, poignant show of love and disaffection. Harvey Fierstein’s book and John Bucchino’s score explore both our need for love and the true meaning of family. 6 Females + 4 Men See the Character List below for more information. These are great characters—don’t miss out on the opportunity to play them! Especially you, gentlemen—don’t be shy! All interested actors are encouraged to audition. • Please prepare a 60-90 second song from any musical that best showcases your vocal abilities and the qualities of the character(s) you are auditioning for. 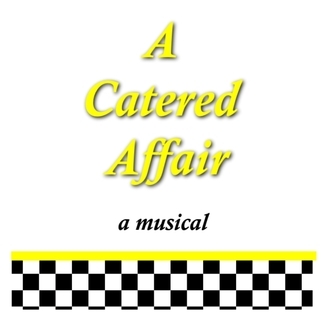 Songs from A Catered Affair are acceptable. • Please bring your accompaniment on your phone/iPad/iPod/tablet—anything that can hook up to an auxiliary cable. Singing a cappella is permitted, but accompaniment is preferred. • You may be asked to do a cold reading from the script, which will be provided to you at the audition if needed. • Please bring a theatrical resume and a headshot or recent photograph if you have one. • Review the rehearsal schedule. Please bring a complete list of conflicts to your audition. After casting, new conflicts will not be accepted. visit www.playhouse1960.com auditions for details about preparing and the rehearsal schedule. Don’t think I can audition. I think I have too many conflicts.